John soloed at Tew-Mac airport in 1970, prior to getting his driver’s license. He began flying scenic flights at Tew-Mac in 1972 and became a flight instructor in 1980. He went on to obtain additional ratings at such places as Airmen Incorporated in Norman, Oklahoma, Dutton Aviation in Haverhill, Massachusetts, and New England Flyers in Beverly, Massachusetts to gain experience flying in a different part of the country and to gain operational experience at different airports. 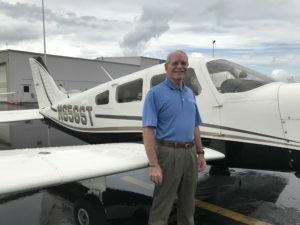 John has instructed at Tew-Mac Aviation, New England Flyers, Aviators of New England, and has been at Beverly Flight Center since 2003. It is John’s goal is to provide the highest level of professional training he can in order to enable pilots to safely achieve their maximum skills and capabilities in aviation.